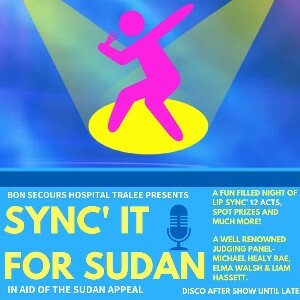 Sync' it for Sudan, a lip sync competition, organised by staff of Bon Secours Hospital Tralee will be held in the Brandon Hotel Tralee at 8.00pm on the 30th September 2017. All proceeds from this event will go towards the Sudan Appeal. Watch 12 acts, including the BSHT hospital management team, put on the performance of a lifetime in the hope of winning the Sync' it for Sudan title. A fun and family friendly event, guaranteed to be filled laughter, spot prizes and much more! Don't be sorry, get your tickets now! Tickets can be purchased from the Hospital Reception or Restaurant at the Bon Secours Hospital Tralee.